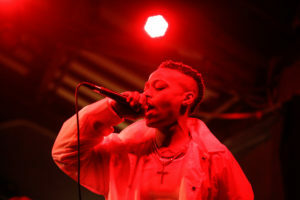 Two mothers, a recent high school graduate and an ex-backup singer were among the five Bay Area performers that dropped their beats and lyrics one by one in the Catalyst Atrium Saturday night. From Youtube freestyle challenges to live performances across the nation, these artists are staying true to their Bay Area roots as they musically combat gender inequity in the hip-hop industry. 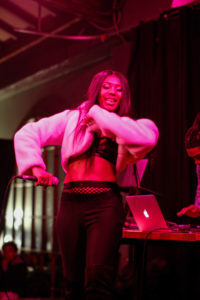 Queen Beats LIVE, sponsored by KZSC, featured a lineup of Bay Area female hip-hop artists including recent high school graduate Trippy Talii, mothers Ally Cocaine and Wani Got the Juice, So Vicious and Phreshly Relevant. Their sounds are inspired by those of late-80s Bay Area hip-hop, known commonly as hyphy. Neroli Devaney, third-year sociology major at UC Santa Cruz, co-organized the show in order to bring the blossoming Bay Area sound to Santa Cruz. She created the KZSC radio program Queen Beats in fall 2016 to promote women who go unacknowledged in a male-dominated industry. The hyphy genre was created by rapper Mac Dre, but wasn’t named until after his death in 2005 when Keak Da Sneak coined the name in his track “Super Hyphy.” However, Relevant and Queen Beats’ other performers are taking the Oakland sound into their own hands by mixing in their own voice. Richmond local Relevant began her music career while studying at Foothill College, where she networked with established rappers who connected her to gigs. Entering into a field in which women are often objectified was challenging, being a lesbian woman who does not conform to traditional femininity. “Everyone in the crowd say ‘Phresh,'”hip-hop artist Phreshly relevant calls out to the audience before diving into her four-song set tackling issues of self-authority. Photo by Lindsey Vande Wege. Many of the music industry’s most dominant music labels only have a small percentage of women, if any at all. As of today, there are no total statistics available regarding the amount of women signed to major hip-hop labels. Relevant is putting her spin on the old hyphy into her own hands, breaking away from the traditional “thizz,” or ecstasy subculture, and instead speaking to female empowerment.